Bulgaria's central bank has asked the two biggest shareholders of troubled Corporate Commercial Bank (Corpbank) - Bulgarian company Bromak and Oman's sovereign wealth fund - to present plans for the bank's rescue by the end of this month. The central bank said it had sent letters to the two shareholders on Friday, adding their proposals should be in line with national and EU legislation. 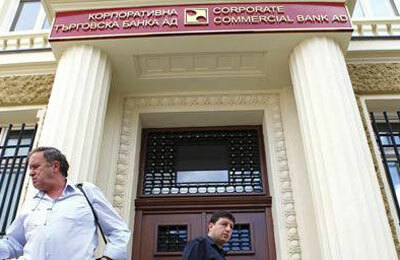 Bulgarian company Bromak, owned by businessman Tsvetan Vassilev, owns just over half of Corpbank. Oman's sovereign wealth fund is the second-biggest shareholder with a stake of about 30 per cent. Bulgarian Interim Prime Minister Georgi Bliznashki said on Wednesday an unidentified fund based in Vienna had expressed interest in rescuing the bank and would present its plan within 10 days. The Omani fund has already held talks with Bulgarian authorities about stabilising Corpbank. Interim Finance Minister Rumen Porozhanov, however, said on Wednesday that he had not met with the Oman fund's representatives since taking office earlier two weeks ago. The central bank said that Bromak had not yet notified it of any initiative regarding support for Corpbank nor had it sought information on the financial state of the lender. Bulgarian prosecutors have charged Vassilev with embezzlement and said that an international warrant for his arrest had been issued. The central bank said the investment arm of the Russian bank, the third-biggest shareholder with a 9.1 percent stake, initially stated interest in supporting the lender but on June 24 publicly declared it no longer had such intentions. The fate of Bulgaria's fourth-largest lender has been in limbo since June, when a run on deposits prompted the central bank to seize control of Corpbank and close its operations, sparking a banking crisis in the Black Sea state. Last Friday, the central bank allowed some banking activities to resume so borrowers can repay loans to the bank but deposits remain frozen. Vassilev has repeatedly denied any wrongdoing and said the run on the bank was a plot hatched by his competitors. He has also previously accused elements of Bulgaria's prosecution service of plotting against him. Private backing would be welcomed by Bulgarian authorities after rescue efforts by the central bank and the former Socialist-led government were derailed by a lack of political consensus in July.